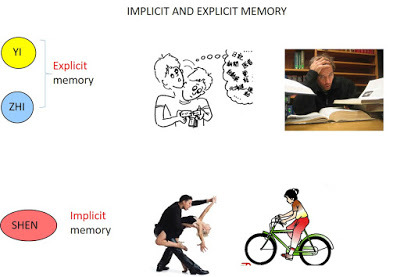 Information that we have to consciously work to remember is known as explicit memory, while information that we remember unconsciously is known as implicit memory. Implicit memory is not always unconscious as it includes what we call “muscle memory” which in psychology is called “procedural memory” (see below). When we are trying to intentionally remember something (like the names of acupuncture points or a list of dates for a history class), this information is stored in our explicit memory. We use these memories every day, from remembering information for a test to recalling the date and time of a doctor’s appointment. This type of memory is also known as declarative memory, since we can consciously recall and explain the information. Shen Qi Si Wu Tang Ginseng-Astragalus-Four Substances Decoction. Calm the Shen (variation ofGui Pi Tang). Tian Wang Bu Xin Dan Heavenly Emperor Tonifying the Heart Pill. The Chinese character for the mental aspect of the Spleen is Yi which can mean “idea” or “intention”. The Spleen is responsible for memory in the sense of studying, concentrating, focusing and memorizing data in the course of one’s study or work. Spleen depends also on the Heart. Secondly, it refers to the Shen’s coordinating and integrating function in respect of the Hun, Po, Yi and Zhi. Gui Pi Tang Tonifying the Spleen Decoction. 3. it is sometimes used to indicate the “five Zhi”, i.e. the five mental aspects Shen, Hun, Po, Yi and Zhi itself. Tang Zong Hai says: “Zhi indicates Yi with a capacity for storing ”. The character for Zhi is indicated below. It is composed of Shi on the upper part and the “Heart” in the lower part. Zuo Gui Wan Restoring the Left [Kidney] Pill. Liu Wei Di Huang Wan Six-Ingredient Rehmannia Pill. Nourish the Root (variation of Zuo Gui Wan). In the sphere of thinking, remembering and memorizing there is considerable overlap between the Yi of Spleen, the Shen of Heart and the Zhi of Kidneys. The main differentiating factor is that the Spleen is responsible for memorizing data in the course of one’s work or study. For example, it is not uncommon for someone to have a brilliant memory in his or her field of study or research (a function of the Spleen), and yet be quite forgetful in daily life (a function of the Heart). The Heart and Kidneys also contribute to this function, but they are also responsible for the memory of past events and implicit memory. In particular, the overlap between the Yi and the Shen in thinking activity is very close, so much so that the “Ling Shu” says in chapter 8: “The Heart function of recollecting is called Yi”. In turn, the memorizing function of the Yi is so closely related to the Zhi of the Kidneys that the same chapter continues: “The storing [of data] of the Yi is called Zhi”. These passages confirm that Shen, Yi and Zhi are a continuum. In modern psychology, “memory” is more that just the ability to store facts and information in our brain. It is actually an essential part in which our consciousness exists, works and manifests itself and working memory plays an important role in our consciousness. Even the thought “I live in the present” requires short-term memory. Even the immediate present requires involves memory – what we know about the one present moment is basically what is in our working memory. Working memory allows us to know that the “here and now” is “here” and is happening “now”. This insight underlies the notion, adopted by a number of cognitive scientists, that consciousness is the awareness of what is in working memory. LeDoux says: “The self is in part made and maintained by memory and both implicit and explicit forms are involved. 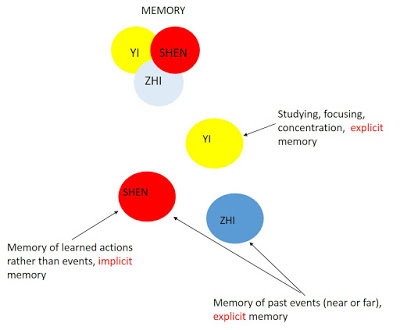 Thus, in a broader sense, Zhi is much more than “memory” in the sense of being able to remember past events. 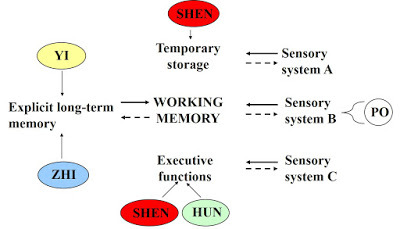 The Zhi (together with the Shen) contributes to our working memory and also to the long-term memory. Together with the Shen of the Heart, this contributes to creating our consciousness and sense of self. 3) It is the vessel through which the Kidneys’ Sea of Marrow reaches the Brain. However, remember that there are other factors at work in memory, e.g. 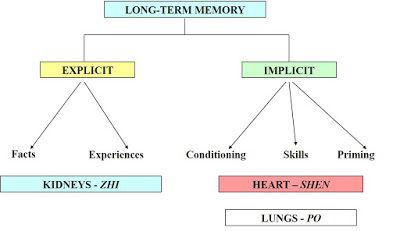 the Lungs affect memory by regulating the amount of Qi reaching the head. Thus LU-7 and LU-3 are important for poor memory due to Qi not reaching the head. The “Explanation of the Acupuncture Points” says that LU-3 can make Qi rise to treat forgetfulness, sadness and weeping due to Qi not rising to head. Forgetfulness is an important indication for this point: this is forgetfulness due to clear Qi not rising to the head. According to the “Explanation of the Acupuncture Points”, this point treats forgetfulness by stimulating the ascending of Qi of both Lungs and Heart. Finally, it is important to remember that memory is affected by Full conditions, especially Phlegm and Blood stasis obstructing the Brain. This happens especially in the elderly. In particular, Phlegm is a common cause of poor memory: when it is, poor memory is accompanied by dizziness and a feeling of heaviness and muzziness (fuzziness) of the head. The tongue is swollen, illustrated below. Points for Phlegm obstructing the Brain and affecting memory are: Du-20 Baihui, Du-24 Shenting, ST-40 Fenglong, LU-7 Lieque, Ren-9 Shuifen, Ren-5 Shimen, BL-22 Sanjiaoshu, P-5 Jianshi. 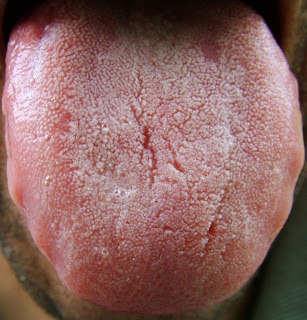 These two tongues are both swollen, indicating Phlegm.